Posted on 22 January 2015 at 9:39 pm. This is a blog I wrote in my head in the summer, in Croatia, when the sun was hot and water was warm and there was loads of time for the kids to play without having to do homework after a long day at school (don’t get me started). 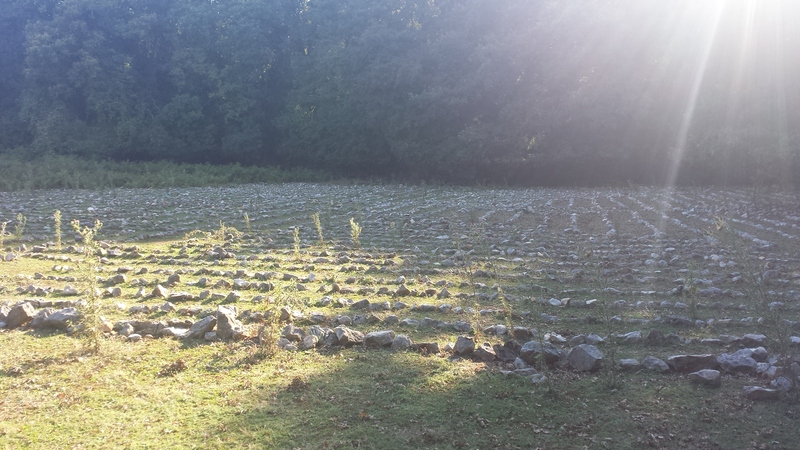 Just up the hill from where we were staying in Cres there was a labyrinth which was over 2000 years old. I walked up the stony path one night; the dappled the light and the path evened out as I went up. I got to the sign which led of the track to the labyrinth but didn’t follow it the first time. The two other women on the holiday that week also wanted to see it and for some reason it felt really important to go up together. So one evening, we three left the kids with the men folk and wended our way up the track, easily sharing and listening to each other’s experiences and laughing at the way life can be. We quietened as we arrived at the sign. S had read that if you enter the labyrinth with a question, you would find the answer as you walked. So as we stood in the mossy shade, we silently turned inwards to ask the question before entering the field and the labyrinth. You might be thinking ‘So What?’ ‘What on earth has that got to do with me’? Maybe some of what I noticed in the labyrinth is stuff you recognise in yourself too. I was last to step into the labyrinth. I often am slow to get involved, I keep myself back to watch the situation before diving in. This is partly the inntrovert part not wanting to be in the spot light and being happy for other people to take it. When is it helpful? When is it not helpful? C and S had entered the labyrinth through a different entrance and I caught myself asking myself if I’d gone the wrong way. gone through the wrong exit, and whether I ‘should’ have followed them. My therapist spent a lot of last year putting her hand up in the air above her head as if to dive saying ‘this is where you put other people’s opinions of you’. To then bring her arm out in right angles to her body, in line with her shoulder to say ‘ and this is where other people should be: at the same level as you’. Do you think that other people know better? Do better? Are better? How do you give your power away to other people? I was sure that I was going wrong, going the wrong way, doing it wrong..but I carried on anyway. I followed the track and twisted and turned when it did and it all turned out OK. The thought that I was ‘going wrong’ was just a thought, a false belief which luckily my feet ignored enough to keep me moving and take me to where I was meant to be. What does ‘going wrong’ mean to you? Is it true that you can ‘go wrong’? I’m not great at this, I like to know what’s happening and why and very often I want to be the one to organise things. But the labyrinth reminded me to surrender and to just see what happened. Is there anything in your life which you are trying to control? What would happen if you just surrendered? When have you felt lost? What or who ‘found’ you? Woo…linked to 4 and 5 of course, it’s hard to surrender when you don’t trust and it’s easy not to trust when you’re scared. But when I look back on life, nothing really goes wrong. Yes there is death, sadness, ending, pain, but it passes and we (hopefully) learn from it and move on. As soon as I brought my attention to my sense and what they were showing me, I began to enjoy the experience. I notice the different shapes of the rocks, I felt the breeze on my face and in my hair, I enjoyed the sun on my back..it was lovely. How often are you really present, in the moment? How would you like this to be different? LLL9 – you are never alone. I had felt like I was alone as the other two had gone the other way, but as I walked and paid attention, I saw lizards darting and beetles scuttling, I was never alone for long. The same is true of life…we spend our days surrounded by people, it’s just that we don’t notice them and appreciate them or reach out to them. If we see them and pay attention we are never alone. After mum’s cat died, I was worried she was living on her own. But she pointed out of the window to the birds and said ‘how could I be’? Who or what could you reach out to when you are feeling lonely? The more I paid attention, the more I appreciated the shade when I was under the trees and just as it was getting cool, I would step out into the sun and soak in the warmth. We kid ourselves that we will get to a point in our lives when everything is ‘sorted’ (or at least I do), but the labyrinth reminded me that there is always change and to appreciate whatever is going on right at that time. A cliche I know. 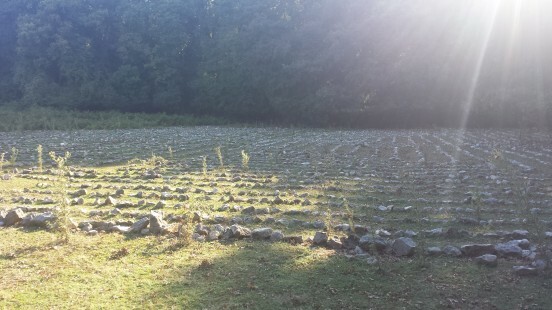 There was a center to the labyrinth but the more I walked the less bothered I was about getting there. I dropped the need to reach a goal or destination and just enjoyed each step. Each step was a destination in itself, there was no need to be anywhere else. How can you enjoy the moments in your life more? Although I had worried at first that I was doing something different from the other two, of course the truth was we were all walking our own path, in our own way. We couldn’t help but be different as we are different and what we experienced in the labyrinth was different for us all. Why do we pretend to fit in and accommodate as much as we do in life when we really do all have our own pace and our own stride and our own path to walk. Are you walking our own path? Does it feel true for you? If you’re off course…and you knew the answer for how to get back on course – what would the answer be? It felt special when we did cross paths with each other. A fleeting moment of company before we moved on again. In my life I have tried to hold on to people I have crossed paths with; I have wanted them to walk my way, or I have changed my path to walk theirs. But in the labyrinth it became OK to cross paths and move on because just that fleeting moment had enough presence in it in itself. There were moments in the labyrinth, where we were on different paths but walking in parallel, in the same direction, in silence. We didn’t even make eye contact but we each felt each other’s presence and enjoyed the company. We didn’t demand anything of each other or try to change each other, we just walked side by side in silence, journeying together and apart. Who are the people walking alongside you at the moment on your journey? On the way home, we shared snippets of our experience with each other. We had each had our own insights, experiences and thoughts. We had all had our questions answered in our own way. There was no ‘one size fits all’ insight, but what we got was perfect for us and so it is in life. The life we live is our journey, it is up to us how to walk our path and make meaning of it. We all started, but we started differently, at different times, at different pace, with a different gait. We ended at different times. The walk at times felt longer than I thought it would be, but when I stepped out – it felt very short. We all start, we all end, time is short. Let us not worry about how other people walk their path, or where their path leads. Let us pay attention to our path and enjoy it’s changes for the only thing that is certain is that it will end.